In light of the tragic events of this morning, the Tony Awards moved forward with a heavy heart, but in true Broadway fashion: "the show must go on". Perhaps we can all take a cue from this statement and honor the victims by taking a stand and hopefully a step in the direction towards a more compassionate, brighter world. Bebe Neuwirth wore a romantic lace Dolce and Gabbana gown accessorized with a black clutch to provide a little edge. In typical Zac Posen fashion, Jourdan Dunn's dress was gorgeously corseted and featured an elegantly cascading high-low hemline. Simple, chic and fresh in Stella McCartney was the look for Saoirse Ronan, who is a quickly rising red carpet star. 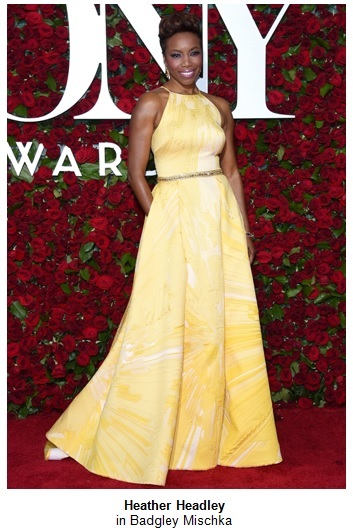 Heather Headley looked gorgeous in a yellow printed high-neck Badgley Mischka gown. She has a special bond with the designers, who also designed her wedding dress. Zuhair Murad designed Lucy Liu's floaty lemon chiffon gown. The plunging neckline kept the look from being overly sweet. Playwright and actress Danai Gurira shone in a goldenrod Rosie Assulin gown, punctuated with a purple clutch and navy heels that peeked out from beneath her high-low hem. While the light and bright red carpet trends at the Tony Awards were in keeping with the current Spring/Summer season, the most important fashion statement was made with the silver ribbon you'll notice that many wore. These were created by Tony-winning designer William Ivey Long to honor the victims in Orlando and show solidarity in a world where, in the words of host James Corden, "hate will never win".